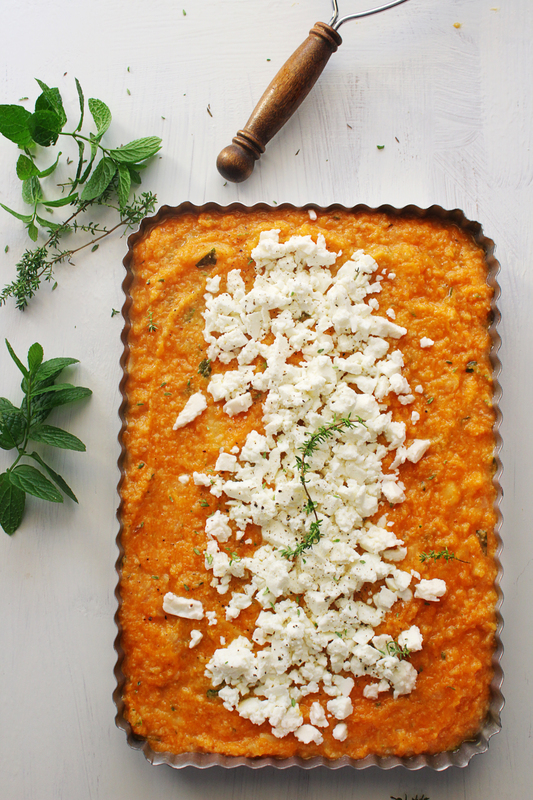 An – out of the ordinary – Mediterranean savory pumpkin pie with feta cheese and Mediterranean herbs. 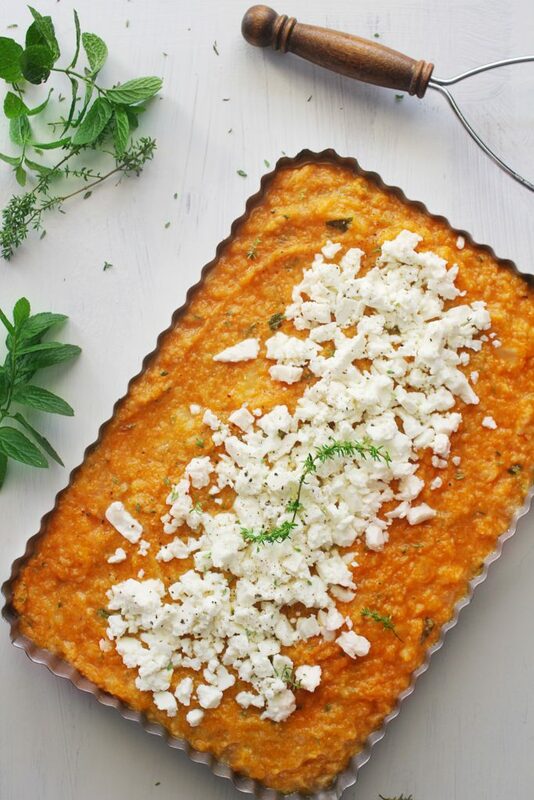 An amazing combination of sweet pumpkin roasted with tangy feta cheese that you really should try at least once in your life. It goes even further because the right choice of herbs takes this pumpkin pie to the next level. Not yet convinced? You will be! Because it is ridiculously easy to make since no phyllo dough of any kind is needed here. Read on, guys and taste all that deliciousness! So delighted I am back again! This last month had its ups and downs, and I was so distracted to sit down, concentrate and write a decent post. Not to mention my first hosting migration which was smooth enough but still a timing consuming task for a rookie like me. Of course, I was cooking and made some very interesting dishes worth presenting to you but still no in the mood to take my camera and start shooting. Meanwhile, I was drooling over pumpkin dishes like soups, pies, cakes, bread and one day my creativity just woke up. Just like that one day I grabbed my camera and start shooting. It’s pumpkin season and I cannot look the other way. Impossible. 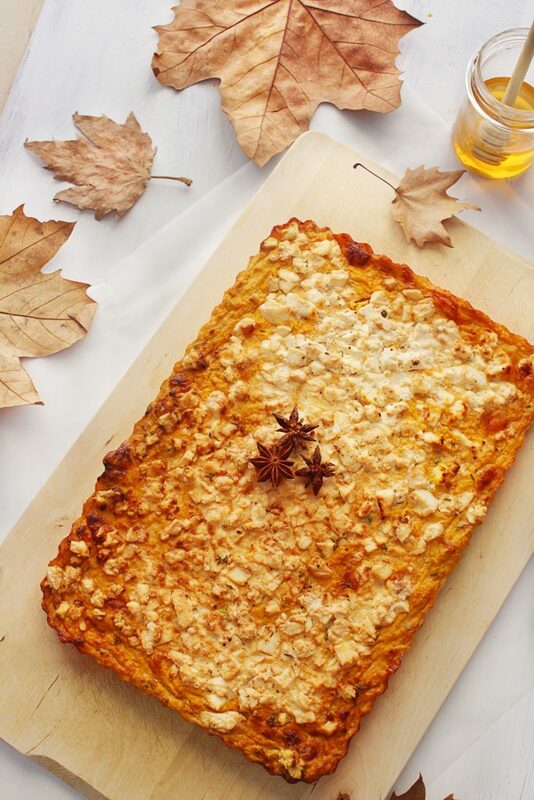 Pumpkins are so versatile and I really love all those options for sweet and savory dishes. I really have to share this savory pumpkin pie with you because I know you are going to love it. 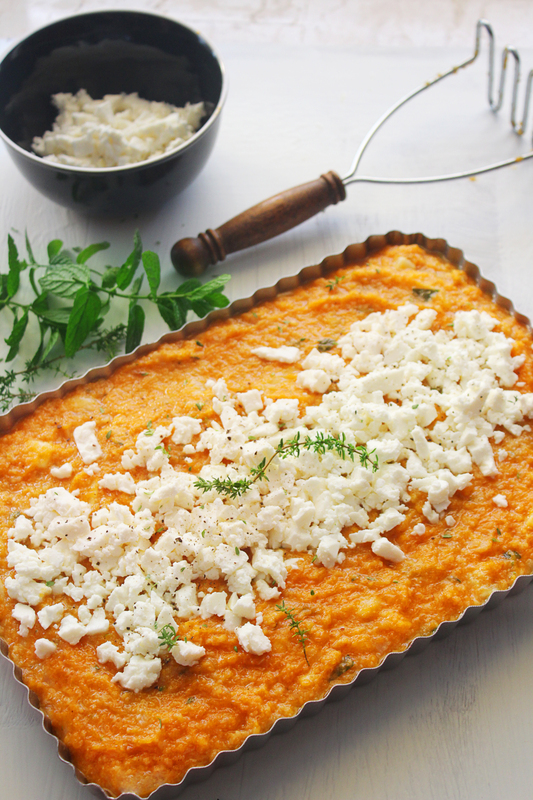 The concept is outrageously simple, a kind of “lazy housewife” pie like we call some traditional pies without phyllo dough in Greece. So, make it easy on yourself and go for this no hands-on recipe. Only waiting time. Just simmer the pumpkin and then add eggs, bread crumbs, cheeses, and herbs. In the oven for 40 minutes. Done. Then you can taste the Mediterranean sun into your savory pumpkin pie while it snows outside. Sweet! This pie is perfect for breakfast or/and brunch, snack, lunchbox. You may ideally accompany it with a salad for a delicious and light lunch or/and dinner. Tired of the same traditional pumpkin pie for Thanksgiving? 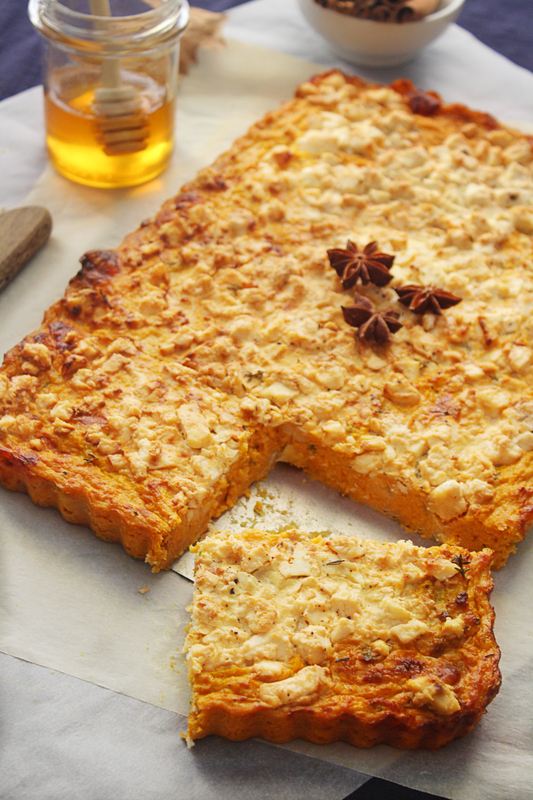 Bold enough to taste a new healthier savory pumpkin pie with a Mediterranean flair? 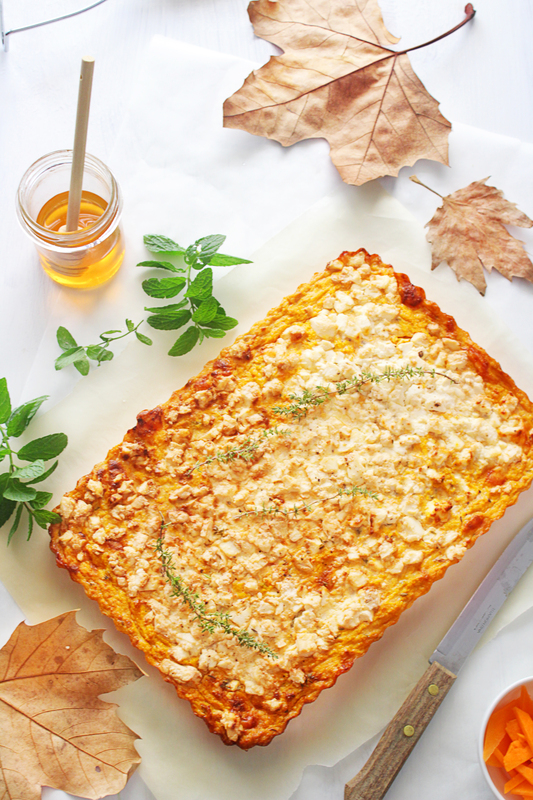 Make this drool-worthy savory pie and enjoy all the yummies and mmms of pleasure around this year’s Thanksgiving table. #1 You can use any pan shape available. I have used a rectangular (11 x 7in / 28cm x 18cm) pan. #2 Add gradually breadcrumbs, toss and wait for a while to see if there is liquid. Then add some more, if needed. The goal here is to absorb excessive pumpkin’s liquid that could turn our pie into a mess. Don’t overdo it and make a weird pumpkin bread instead. #3 When you add the eggs, make sure that the pumpkin mixture isn’t hot enough to make them an omelet. #4 No need for salt. That’s what happens when you use good quality cheeses like feta cheese and parmesan. In a large pot, over medium heat add 3 tablespoons olive oil and sauté onion for 2-3 minutes, garlic for another 2 minutes. Adjust heat not to burn them. Toss in the pumpkin, thyme, mint, pepper and sauté for another 5 minutes. Pour in hot water to cover pumpkin and bring to a boil over high heat. 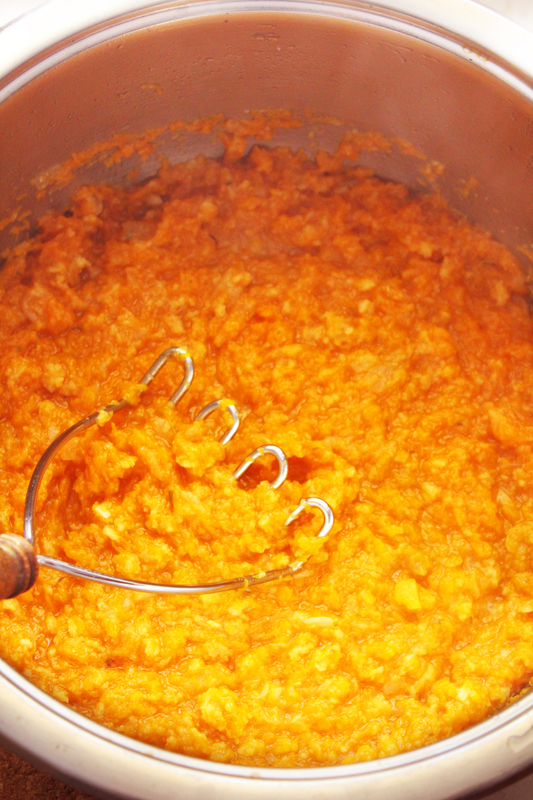 Reduce heat to medium-low, cover and cook for about 20 minutes until the pumpkin softens. Add gradually breadcrumbs, toss and adjust according to the amount of liquid. Remove from heat and set aside to cool. In a small bowl, beat the eggs and add them to the mixture. Add hard cheese and toss until well incorporated. Grease the bottom and sides of the pan with olive oil and pour in the pumpkin-cheese mix. Spread evenly. Add feta cheese crumbles on top and season with freshly ground pepper and some more fresh thyme, if desired. Bake for 45 minutes until golden. Remove from the oven and serve warm.